Starting 1 November 2018, we stop supporting Adobe Flash in FlippingBook Publisher. It means that it will no longer be possible to create or change Flash publications in the future versions of the software, only HTML5 ones. At FlippingBook, we always strive to deliver the best to our users. It goes for the quality of the software, the end publications you can create, and the quality of the support. We started getting requests to move to HTML5 back in 2013. At that time, the first signs appeared that Adobe Flash wouldn’t be there forever, but the format still had a long way to go before HTML5 could outbeat it in power and flexibility. HTML5 could not provide the same quality and beauty of page flip animations that Flash did, and we didn’t want to drop the quality benchmark we’d set, because our users valued it. So Flash remained our technology of choice. In 2016, big companies, including Apple, Google, and Mozilla, began to actively push Flash out of operation by hindering the use of the Flash plugin in their browsers. 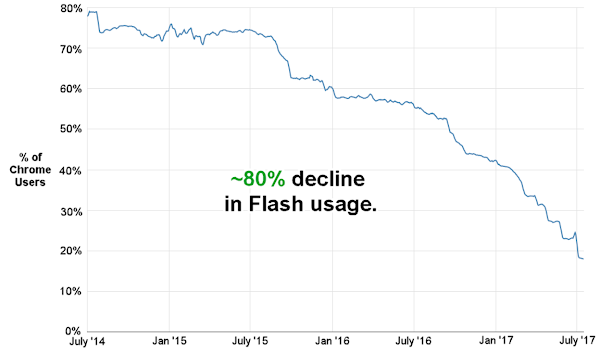 The Flash usage levels were dropping dramatically - and fast (as of July 2017, only 17% of Google Chrome users visit websites with Flash). The numbers continue to decline. If you and your viewers work in the latest Chrome, Mozilla, Opera, or Safari, there’s almost a 100% chance that you cannot use or see Flash. Back in 2016, before our Flash users started to have major issues with their publications, we took another look at HTML5 and found a way to implement it into the publications while maintaining the quality standards. And in December 2016, a new version of FlippingBook Publisher came out that allowed creating pure HTML5 publications. Sure, the new format was different from Flash and lacked some features, but for the next 15 months we worked to improve and enhance it. Many features were reintroduced, brand new ones added, and dozens of improvements are in store. The latest HTML5 publication looks nothing like its earlier version, and, compared to Flash, it’s much faster, sleeker, and more powerful. Meanwhile, we’ve kept supporting Flash to provide users with the time to move to HTML5 without hassle. And according to our data, 85% of FlippingBook Publisher users have already moved to HTML5. This leaves us with a huge chunk of the software that has been frozen, cannot be improved (as Adobe will stop supporting Flash in 2020), and that fewer and fewer people use. The need to support Flash slows down the software performance and hinders the development of new features tremendously. So, sadly, we came to a point where we have to stop supporting Flash to provide a modern, powerful, and useful tool we’ve always wanted FlippingBook Publisher to be. After our November software release, it will no longer be possible to create or update Flash publications in the later versions of FlippingBook Publisher. What if you aren’t ready to move to HTML5? Throughout 2017, we spoke with many of you, discussing the ups and downs of HTML5, and tried to understand why switching to HTML5 may be difficult or even unacceptable for some users. As a result, we noticed several major concerns that we would like to address here. page thickness will be brought back in 2018. Plus, many visual improvements are being added into HTML5 publications, such as notes, GIF-animations, popup gallery, and page flip on mobile devices. We do understand that reconverting more than a dozen publications can be tedious. That’s why starting ver. 2.8.16 (30th March 2017), FlippingBook Publisher has a built-in Flash to HTML5 Converter. You can select as many publications as you need, and they will be converted to HTML5 automatically. Here’s a tutorial. E-commerce should be available in 2018, though it will be a light version. Offline publications, Background sounds and slideshow have already been reintroduced. We hope this article answers the questions you may have on moving to HTML5, but if it doesn’t, please contact us, and we’ll be happy to discuss the details with you. And no matter what your concerns are, we’d like to ask you one question: is Flash really worth it, when 80% of your viewers don’t see the publications you create? What do I do with the existing Flash publications? We suggest that you take a look at your Flash publications and choose the ones you would like to keep current and timely. These can be easily re-converted to HTML5 using our built-in Flash to HTML5 converter. It’s available in FlippingBook Publisher starting ver. 2.8.16 of March 30, 2017. All you need to do is open your Flash project in FlippingBook Publisher, and the software will offer to re-convert it into HTML5, but here are specific instructions just in case. What happens to the existing Flash publications on my server/FlippingBook Cloud? They continue to work as usual, unless you need to update them. Please, note though, that if they are intended for public display, 80% of users don’t see the full interactive versions of your publications. What if I need to keep creating Flash publications? We suggest using the latest version of FlippingBook Publisher released before November 2018. This version should work just fine, and if you need to create new Flash publications or update the existing ones without re-converting them to HTML5, you will be able to do it. However, please, keep in mind that if you intend to use Flash publications externally, your potential audience might be very limited, as 80% of Internet users don’t have access to Flash. We would be happy to answer your questions and provide assistance in moving from Flash to HTML5. Please, feel free to reach us at support@flippingbook.com if you need help. We’re available 24/5 with limited availability on weekends.